Botswana is deep Africa. The land is vast and the population density is low. Animals roam freely and grasses stretch high above your head. The sun feels close and palpable — the heat flattens you and then cooks you while you sleep. You get the feeling that nature has reigned here for a long time. The Kalahari desert is old and wise and massive Baobab trees can grow thousands of years old. In true African form, Botswana is rich in wildlife, national parks, tribal peoples, insects you could trip over, and cultural idiosyncrasies. There are Foot and Mouth checkpoints at the border and along rural, two-lane highways. You are only free to pass after you get out of your car and dip the shoes you are wearing, plus one extra pair, into a tray containing a filthy liquid and a deteriorating towel. And there are new creatures to be mindful of. We were warned to check for snakes before breaking down our tents in the morning. Apparently they like to burrow under at night and we don’t want to kneel on them or pack them when we roll our tents. Scorpions have also been added to the mix. We took a cruise down Chobe River and got up close to a 59 year old, 10 foot crocodile, a 3 month old, 9 inch crocodile with big aspirations, and many hippos. Their backs were all streaked by scars from past attacks — a reminder that the wild isn’t such a friendly place. We took Mokoros, traditional canoes made from dugout tree trunks, through the waters of the Okavango Delta. One small man or woman stood at the back of each boat with the arduous job of pushing and steering with a tall wooden pole. We sat in stillness to maintain balance as we snaked our way through small, shallow channels thick with reeds and water lilies to set up camp on a small uninhabited island. 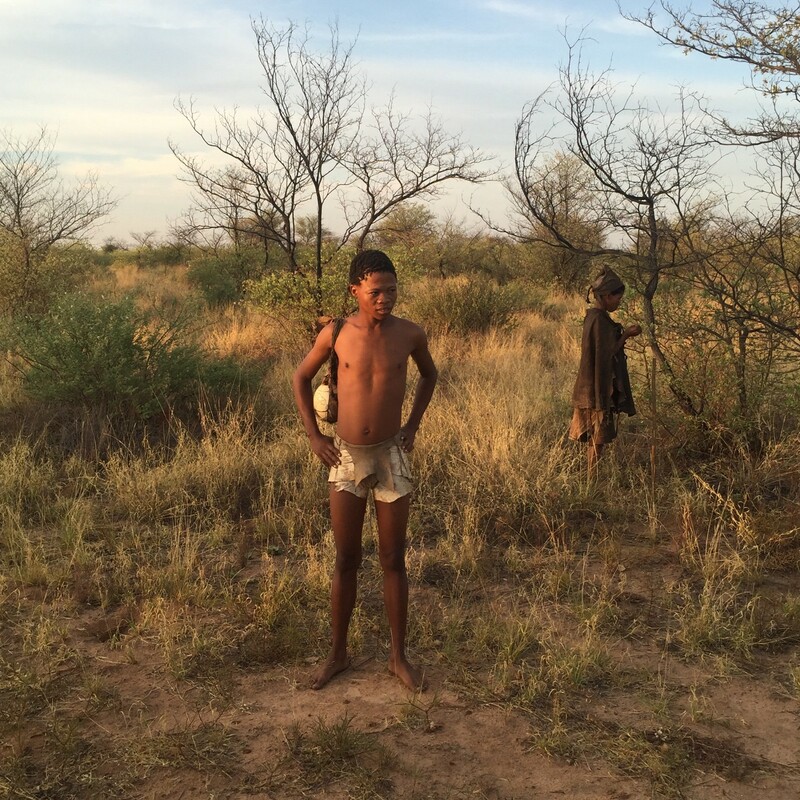 Further west, we met four members of the Khoisan tribe. They carried bows & arrows and dressed in animal hides like replicas in a natural history museum. They speak a mesmerizing clicking language, so a translator helped them tell us about their lives. Learning about their culture is like flipping back the pages of time. The Khoisan people have an incredibly symbiotic relationship with nature. The men hunt for meat but they don’t go for animals in their prime, only the ones who have lived and bred and are deemed ready to feed the community. The women have an intimate knowledge of herbal medicine — which leaves treat liver problems and which roots are good for toothaches. Elephant dung is burned for mosquito repellent. They drank rain water from hollowed out ostrich eggs and easily made fire from two small sticks. I joked that I could never make fire, but I can make a mean s’more. Clearly American upbringing focuses on the important things. Turns out, no one in my group knew what s’mores were. I need to give them a good, old fashioned American education in adding sugar & sugar to sugar. I’ve been looking for a way to travel with a positive social impact. Maybe this is it.